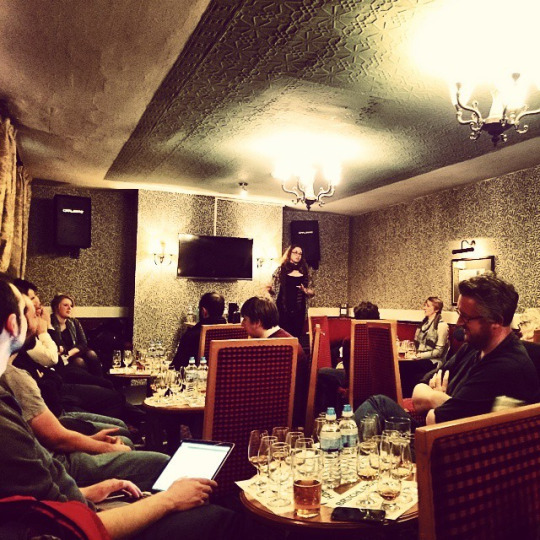 Recently, Joanne Brown of Bruichladdich sat with the Manchester Whisky Club and guided us through the range from Islay. It got me thinking though at my surprise of never featuring the brand on this site. I’d come across Bruichladdich and Joanne at the Fishermans Retreat a few years back, and even worked alongside the brand with tastings across the UK last year, but never had I dived in a really got to know the name and liquids they produce. Bruichladdich was built back in 1881 by the Harvey brothers, William, John and Robert. Located on the shore of Loch Indaal, on the Rinns of Islay (the westernmost part of the island) they utilised their family history as the Harvey name had owned two Glasgow distilleries since 1770 (Yoker and Dundashill). Creating the distillery from scratch instead of the usual method of converting from old buildings, the, at the time, state-of the art design of using stone from the sea-shore and building around a spacious courtyard on a slope had its advantages and set them up for the future (the slope for example leads to gravity-fed distillation, becoming more efficient). They commissioned two unique tall and narrow-necked pot stills, going against the usual wider stills favoured at the time. Only 5 years later, William was left to run the distillery after a disagreement with his brothers. Although he ran the company until his death in 1936, this was to be the last involvement the family had as in 1938, Joseph Hobbs, Hatim Attari and Alexander Tolmie purchased the distillery for £23 000 through the company Train & McIntyre. They themselves then sold it onto Ross & Coulter from Glasgow in 1952, who incidentally sold to A. B. Grant in 1960, then Invergordon Distillers took over eight years later. Despite the many owners, in 1975 the number of stills increased to four to keep up with the demand. This did not last long though as in 1983 it temporarily closed and soon after, Whyte & Mackay bought out Invergordon Distillers, seeing Bruichladdich distillery surplus to requirements in the January of 1995. The brands fortunes turned around though in the new Millennium as Mark Reynier of the group Murray McDavid bought the distillery from Whyte & Mackay (then named as JBB Greater Europe) for £6.5 millon on 19th December, making sure the stock dating back to 1964 came with him. Hiring Jim McEwan of Bowmore fame, he became their Master Distiller and started Bruichladdich’s first distillation on 29th May 2001 after 5 months of dismantling the whole distillery, then reassembled with the original Victorian equipment. In September, the first bottlings from the old casks were released (10, 15 and 20 yrs) followed by the first in the Octomore range in 2002. 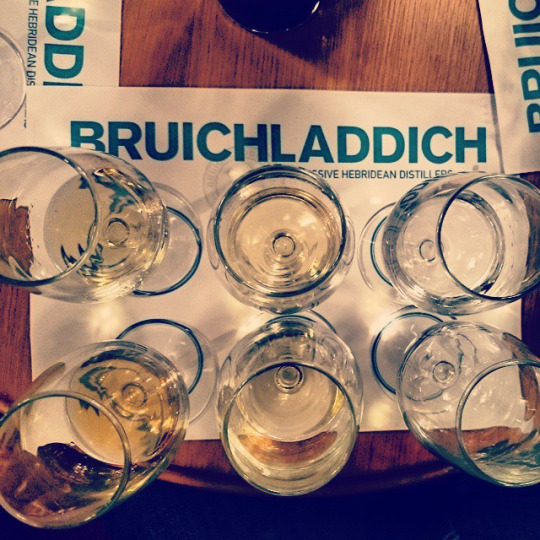 In 2003, Bruichladdich became the only distillery on Islay to have its bottling on-site. On 23rd July 2012, Rémy Cointreau reached an agreement with Bruichladdich to buy the distillery for a sum of £58 million. Made with 100% Scottish barley and matured in American white oak barrels. Peat notes on the nose with hints of vanilla, citrus and citrus fruit. A softer peat flavour on the palate, with the vanilla still present alongside apples and citrus fruits. The peat smooths the dram out with a lingering finish. Harvested in 2006 and distilled in 2007, the grain for this was grown for Bruichladdich in the Minister’s Field at Rockside Farm by Mark and Rohaise French. Heather mixed with ripe fruits of pears and pineapples on the nose, with a palate full of the fruits and floral notes blending well. Produced from crops planted in the Achaba and Achfad fields on Kynagarry farm, Islay. The fields hadn’t been used for agriculture in over a century and no chemicals were used either. Bold citrus aromas on the nose with an oily butter note that follows to the palate. Rather thin and sharp, creating a dry spice in time for a big barley finish. Matured using French and American oak. Fresh fruit on the nose with soft sherry and glazed cherry mixed with green apple. Rich, bold sherry with a developing sharpness upon the palate, with deep port flavours creating a very long finish with plenty of port and a natural sweetness. Peated to 40ppm. Iodine, black pepper and heavy smoke dominate the nose, with a sweet, smooth and slightly warming palate of toffee and vanilla create a long-lasting finish. Peated to 167ppm. Notes of the crisp sea mixed with iodine aromas, with a little pepper and heather following. Lots of flavours on the palate – barley, oak, vanilla, pear and citrus dancing nicely. A warm finish. Peated to 258ppm. Soft dry smoke on the nose with soft peat and damp oak combining. Oily on the palate, lots of malt, with a very sharp kick of heavy peat, backed by an underlining sweetness that creates a lingering, dry finish. 21-year-old whisky aged in American oak and finished in Pedro Ximenez sherry casks. Deep notes of port and sherry on the nose, with a very smooth offering of vanilla. Rich sherry on the palate, with citrus notes drying out the experience to create thin yet very long finish. 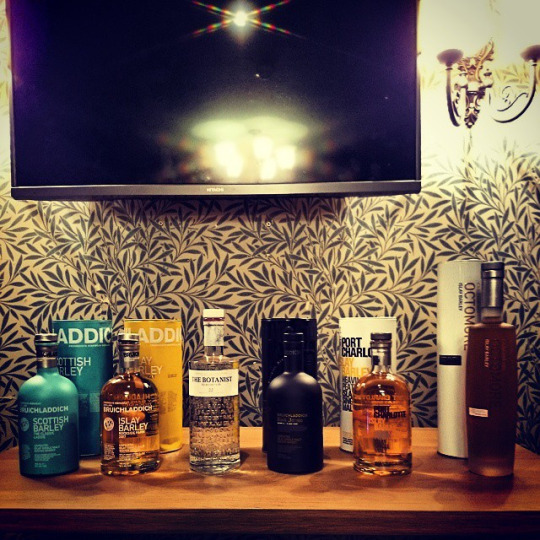 Going from unpeated, to heavily peated to super heavily peated offers a cracking change in flavour profiles, and offers the world surely something for everybody. If you’re still struggling, perhaps The Botanist gin would help? In the 17 hours of distillation, the gin is distilled after an overnight maceration of the nine base botanicals – the seed, berry, bark, root and peel categories – in spirit and Islay spring water. This alcohol vapour infusion from the distillation then passes through the botanical basket containing the 22 more delicate Islay aromatic leaves and petals, effectively creating a double infusion. Bold apple and mint aromas on the nose, with orange, lemon and natural honey following nicely. Soft and very smooth texture on the palate, with a warming of citrus and floral orange. Slight spice on the tip of the tongue, but a great blend of subtle flavours, with a mint finish. So perhaps Islay’s first and only gin could be a treat for you? Whether it’s Bruichladdich using 100% barley from Islay or Scotland, or The Botanist with its fray into a variety of botanicals, I think you’ll be covered for any time of the day! Grab some bottles, crack them open and enjoy.